The Federal Trade Commission (FTC) announced in a September 14, 2015, press release, "FTC Sends Warning Letters about Green Certification Seals," that it sent warning letters to five providers of environmental certification seals and 32 businesses using those seals, "alerting them to the agency's concerns that the seals could be considered deceptive and may not comply with the FTC's environmental marketing guidelines." FTC states that environmental certification seals are intended to help consumers tell whether a product has the environmental attributes it claims. FTC cautions that environmental seals "can inadvertently deceive consumers by conveying more than a marketer intends." FTC's Guides for the Use of Environmental Marketing Claims (Green Guides) include guidance intended to help marketers avoid this issue. Without careful qualification, general environmental benefit claims pose a risk of deception. FTC's warning letters include a caution from the Green Guides: "Because it is highly unlikely that marketers can substantiate all reasonable interpretations of these claims, marketers should not make unqualified general environmental benefit claims." Certifications and seals that do not explain the reason for the thumbs-up may convey broad claims that cannot be substantiated. According to the Green Guides, a certification or seal that does not explain its underlying basis "likely conveys that the product offers a general environmental benefit." The "bad example" above does not explain the grounds for the seal. Companies can take steps to reduce the risk of deception. The Green Guides suggest accompanying a certification or seal with "clear and prominent qualifying language that clearly conveys that the certification or seal refers only to specific and limited benefits." 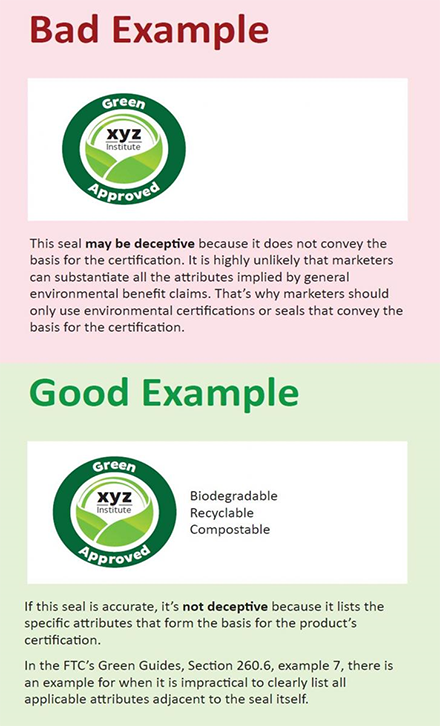 The "good example" shows that including the words "Biodegradable, Recyclable, Compostable" provides specificity to the company's claims. Logos themselves are not likely to be effective hyperlinks. According to FTC, because consumers may view the visual as just another graphic on the page, "a symbol or icon might not provide sufficient clues about why a claim is qualified or the nature of the disclosure." FTC suggests making it big, easy to understand, and close to the claim it qualifies, as recommended in FTC's staff guidance publication, .com Disclosures: How to Make Effective Disclosures in Digital Advertising. Both the certifier and the advertiser have responsibilities under Section 5 of the FTC Act. FTC sent warning letters to both certifiers and to marketers that display their seals because both groups have responsibilities for avoiding misleading claims. The FTC has resources for companies that want to keep green claims clean. FTC states that it wrote the Green Guides "with busy executives in mind." More detailed information is available in the Green Guides' Statement of Basis and Purpose. FTC suggests bookmarking the Business Center's Environmental Marketing web page for free multimedia resources. FTC states that, at this time, it is taking no law enforcement actions, and it is not disclosing the names of the companies that received warning letters. More information regarding the Green Guides is available in our October 3, 2012, memorandum, "FTC Releases Revised Green Guides."